Keeping active is a key to aging successfully. A regular routine of exercise not only burns fat but also supports your body and brain functions. 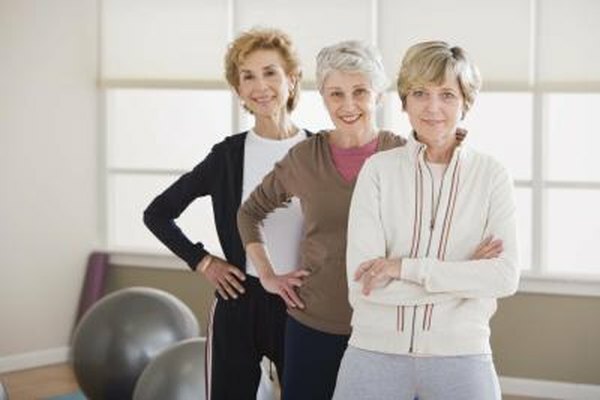 Women over age 50 can look and feel years younger by performing exercises that burn calories, and tone and strengthen muscles and bones. Due to changes in tendons and ligaments, flexibility decreases and joint movement becomes restricted as you age. Poor flexibility and decreased joint range of motion can impede routine tasks such as walking, shopping, housekeeping and even breathing. Dr. Karl Knopf, author of "Stretching for 50+," recommends a range of simple stretches including head and shoulder rolls, wrist and ankle circles, twisting your torso from side to side and touching each of your fingertips to your thumb. Weight gain is a common occurrence for middle-aged women. In fact, the website WomenFitness.net claims that most women tend to gain about 10 pounds in the decade after reaching age 40. As women age, loss of muscle mass occurs, slowing down the body's metabolic rate, causing high cholesterol and adding unwanted pounds. Cardiovascular training revs up your heart rate and burns calories. If you haven't already, get the okay from your doctor and start with 30 minutes of any aerobic exercise such as swimming, brisk walking, jogging, tennis, dancing or biking. Muscles take longer to respond in your 50s than in your 20s due to a reduction in size and loss of muscle fiber. As muscles shrink and lose mass, they lose tone and become stiff and sore. It becomes difficult to perform simple tasks such as lifting grocery bags or opening a jar. Strength training can replace lost muscle, increase your metabolism and deter obesity and diabetes -- significant health issues for women over age 50. The National Institute on Aging suggests low-impact exercises including repetitive arm raises, biceps curls with light dumbbells, standing from a sitting position, side leg raises and standing on your toes. Bones lose mineral content, density and mass, and become fragile as the aging process progresses. Additionally, menopause can cause a substantial drop in estrogen, accelerating the loss of bone mass by as much as 20 percent, according to Dr. Mitchell Krucoff, author of "Healing Moves." As bone mass decreases, osteoporosis can develop, leading to hip fractures and a dowager's hump in women. Resistance training utilizing resistance bands or light weights can help ward off bone deterioration. Dr. Krucoff recommends two to three 20- to 40-minute sessions per week of strength training exercises, including biceps curls, lunges, knee extensions and seated arm curls. He adds, "For the extra bone-building boost of vitamin D, exercise outdoors in the sunshine." Weight-bearing exercise such as dancing and walking also increases your bone density.